"San Francisco, 1875�the Carlton Hotel�headquarters of the man called�Paladin!" Wherever there's trouble -- there's Paladin. He is called on to find missing people, to find a way to protect those who have been targeted by the unscrupulous, to find criminals, and to find a resolution. 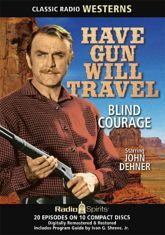 John Dehner stars as the peripatetic champion of justice in twenty taut, thrilling tales of Western adventure from 1959. Ben Wright co-stars as Hey Boy, with Virginia Gregg as Miss Wong, in this series produced and directed by Norman Macdonnell.